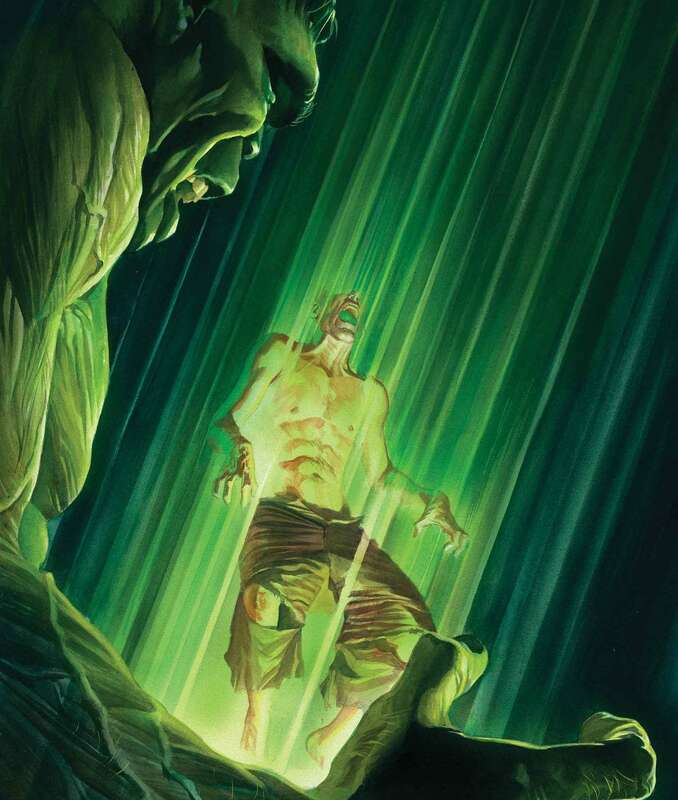 The Immortal Hulk #13 review: Hate and Love – AiPT! Hulk and Banner. The One Below All. The Father. Dichotomies. They’re at the heart of The Hulk. The Man. The Monster. But what is he, really? It’s a question that’s often been asked and Immortal Hulk posed that immortal question to its readers from the very start, beginning with its very first chapter, fittingly titled “Or Is He Both?” Picking up from the previous issue and keeping with the pattern of the 6-panel grid sequences delving into the philosophical ideas, #13 keeps the momentum going. Opening with a fitting philosophical quote that sets the stage for each issue’s content has been a bit of a tradition for the title and this installment kicks off with a Dostoyevsky quote from The Brothers Karamazov. Relating to the nature of fathers, hell and love, it’s a fitting opener for a tale confronting the lord of hate, The One Below All! Al Ewing, Joe Bennett Ruy Jose, Paul Mounts and Cory Petit return once more to plunge us back into the Hellish realms of The Hulk! The book kicks off by asking the reader bluntly, “What is the Hulk?” in the black and white segments we’ve all come to expect. The first one began by posing the question “What is Hell?” and the second asked “What is the Devil?” and this final third sequence is a fitting finale to these segments we’ve been seeing. Culminating in the one absolute question that plagues the character’s entire history, while steeping him in theological ideas and concepts from The Quabalah. Building on this, the book introduces us Geburah, the Judge of all Evil, the accuser who burns and purges, as well as Geloachab, the destroyer, the monster and adversary who hurts. Placing the entirety of the Hulk mythology squarely between two ideas, the captions explore the implications of the concepts while the narrative plays out over the course of the issue. Ewing and Bennett really get to let loose in these pages, as they bare the heart of the book out for everyone to see. Meanwhile, The One Below exclaims how his power is hate and begins to turn every being in his realm of Hell into a deformed Hulk and Sasquatch-esque monstrocity. Mindless and terrifying, the rabid beasts storm The Hulk. Whilst the battle ensues, we catch up with Puck and Crusher Creel, where in the book only more loops back to its core conceit of dichotomies. Puck explains The Theory of Everything and discusses that it could never be completed since science is merely one half of reality, whilst the other is magic. Gamma is that rare thing which binds together both, effectively being science and magic, thus The Hulk! Creel, learning this, goes to confront The One Below All and his agent, Brian Banner, and while goaded by the notion of fighting, not for a purpose but to destroy, Creel resists his temptations and instead uses his powers to free Bruce Banner from his confinement. This simple maneuver helps change the game, as Hulk strikes against Brian Banner and blows off The One Below All, finally confronting his other self, Bruce. Hulk can close The Green Door and save everyone, but if he does so without Banner, they’ll both perish. Bruce is fine with the prospect, tired and frustrated by the horror of his endless and painful existence. However, The Hulk manages to convince him, expressing the one thing that can make Hell vanish away: Love. Hulk tells Banner that he’s always been there, before anyone else, since the start and he’s always protected him and he did so because he loved Bruce. And thus The One Below All and Hell, powered by hate, lose all power and vanish the moment Banner grasps the hand of The Hulk, becoming one once more. The entire sequence is rendered beautifully by the artistic team of Bennett, Jose and Mounts. Bennett excels at the epic spectacle of the book but his real strengths are very much in the expressive character work and intimate exchanges. It’s a huge part of why the book works and he nails every beat of the story, while Jose’s inks bring a gorgeous texture and accentuate the horror and beauty of the pencils. Mounts really brings the entire world of the book to life with his colors, ranging from purples and greens to the great oranges. Petit, working with the crew, manages to perfectly land every line of dialogue, from the big, booming might of The One Below All to to the terrified whispers of Bruce Banner. It’s also at this point where the 6-panel segments return, asking us what the Hulk even is amongst all the concepts presented. And this is also the issue they conclude, with the story revealing that the captions are being narrated by an actual entity of some sort. The narrator reveals that we’ll meet again and wraps up these key sequences of the Hell Saga, thus leading us back to the ordinary world, with everyone relatively safe and sound. Only there’s one catch: Bruce is nowhere to be seen. Moving from the love of self and acceptance, we get to romantic love as Betty Ross re-enters the story. Half-asleep, she receives a phone call and it’s Bruce at last. The story then cuts to the cliffhanger, showing Bruce in a phone-booth calling her. Immortal Hulk is an emotional beast of dichotomies, much like its titular character. Masterfully concluding this first chapter of the longform story, Ewing, Bennett, Jose, Mounts and Petit have established a new standard for not only Hulk stories but horror stories in general. Pulpy, insightful and layered, this is an unforgettable book.